9x12, xxv + 114 pp. Set of 5 parts: vn. ; alto trb. ; bass trb; bn. ; b.c. Set of 7 parts: vn. ; alto va.; tenor va.; trb.1; trb.2; trb. 3; b. Set of 8 parts: trb.1; trb.2; trb.3; trb.4; trb.5; trb.6; trb.7; b.c. Set of 6 parts: cn. 1; cn. 2; trb.1; trb.2; trb.3; b.c. Set of 3 parts: vn., trb., vne. Set of 10 parts: cn. 1; cn. 2; trb. 1; trb. 2; bn. ; vn. 1; vn. 2; va. 1; va. 2; vne. 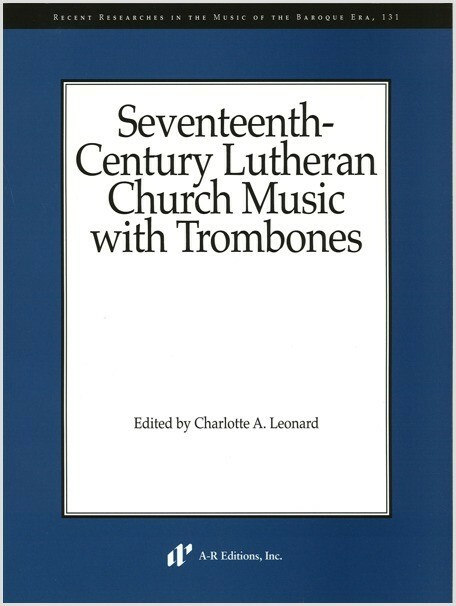 This volume addresses the lacuna in knowledge concerning the use of instruments with voices in Lutheran church music of the seventeenth century in Saxony and Thuringia, highlighting the use of the trombone. The six composers represented (Tobias Michael, Werner Fabricius, Johann Rudolf Ahle, Andreas Hammerschmidt, Wolfgang Carl Briegel, and Christian Andreas Schulze) were highly regarded in their time and were prolific producers of sacred music, although few of their works are available in modern editions. The works included here survey the entire seventeenth century, showing a variety of musical structures, scorings, and uses of voices with instruments. Stewart Carter, Journal of Seventeenth-Century Music, 11/1, 2005.